In the final days of last November, the financial sector looked cheap. Their bullish percent index was 16% and with news headlines about recession, sub-prime mortgages and the credit crunch, negative sentiment about them was rampant. Things are very stretched to the downside here and we are ripe for a snap-back rally. 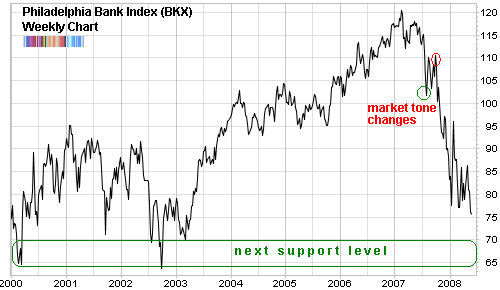 The Philadelphia Banking Index (BKX) in fact did snap back by 10% - after falling more than 20% from its high in October 2007. This counter trend rally took the financial sector bullish percent index up to 55%. But while profitable, for those that rode it, the rally was fleeting. Fast forward to now: The BKX has bounced feebly off the 75 support line 4 times and it is now trying to do so a fifth time. While it may succeed to cling to support and rescue itself from the impending drop, I’m beginning to have my doubts. That’s because somewhere between then and now, the way financial stocks react to rallies changed fundamentally. They started to act as if they were in a bear market, rather than a bull market. When it came to fall, they did easily but rallies only produced reluctant gains. 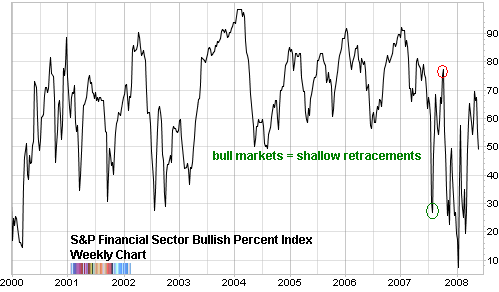 Take for example the incredibly low bullish percent reading in mid-January 2008: 5.5%. That should have launched a massive and protracted recovery. While the bounce was significant, 25%+, it petered out below the December rally high. This created a lower high after a lower low. As you can see from the long term chart, the next support level is painfully far away; between the 70-65 range. At just below 50%, the bullish percent index could potentially fall to 10% or less before we see another counter trend rally. And that would mean that the index itself would invariably have to fall well below the support line. But this itself isn’t as significant as the portent this has for the general market. Financial stocks, are after all, one of the most important sectors. Their health (or lack thereof) is vital for the stock market. No major bull market can be launched and no significant rally sustained without the participation or leadership the financial stocks. Financials are on fire today, finally!! I’ve been waiting for a day like this for 4 days now . Oil reserve numbers were down but for whatever reason oil is now off 80cents which is helping the financials. Lets hope this financial rally has some steam! yeah, lol, right on time after I wrote this [shakes head] the market is a sneaky vixen, isn’t it? But then again, this is a general snap back rally of sorts.